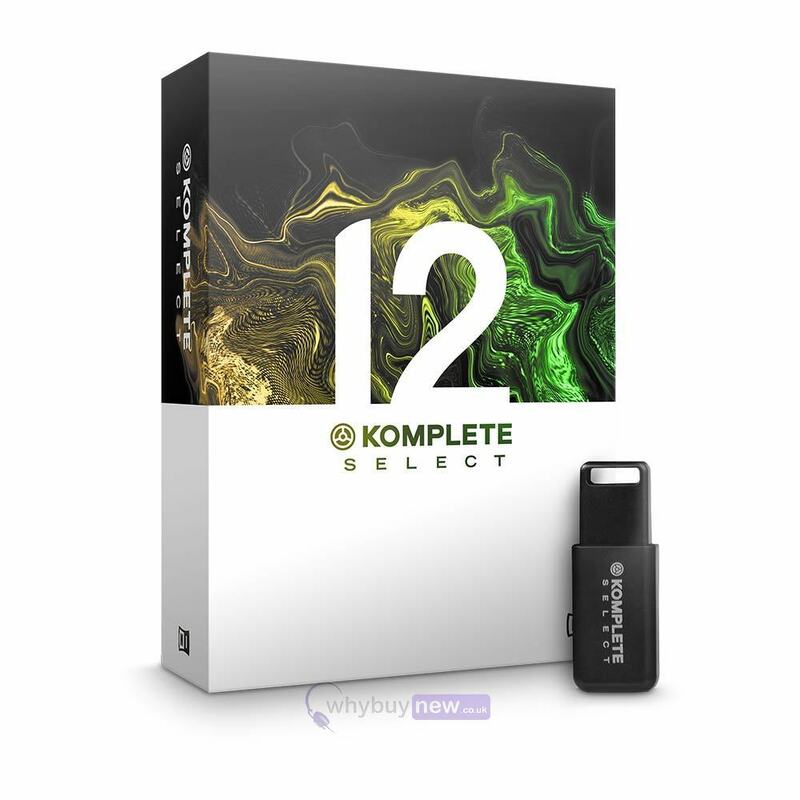 Komplete 12 Select from Native Instruments is the entry level software package designed to give you a ideal introduction to what Native Instruments and Komplete 12 can do. This essential software bundle includes over 7000 sounds and a massive 45GB of instruments and effects for you to use when creating new music. Komplete 12 also some with three specially chosen expansions which have been created and put together by artists who are well known and respected in their field. 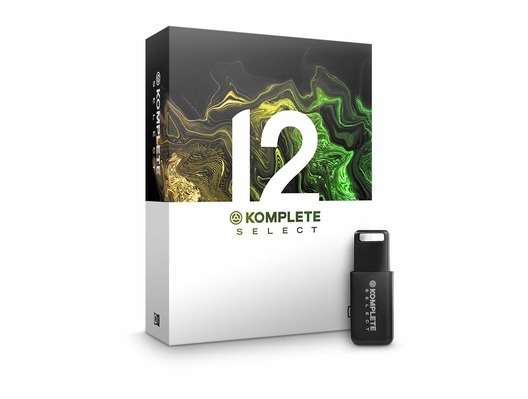 Setup of Komplete 12 is easy and can be installed from a one pen drive, please be aware that an internet connection is required to install and activate this software package. From cutting edge synths to studio-quality effects, Komplete 12 select is the perfect introduction to pro-grade sound for production or performance. This collection contains 14 premium instruments and effects - including Massive, Monark and Drumlab - plus three expansions. Komplete 12 Select includes three hand picked Expansions - genre-specific sound packs loaded with synth presets, drum kits, one-shots, samples and loops. Created by top artists and sound designers, Expansions can be used in any DAW and work with a range of Native Instruments products, including Massive, Battery 4 and Monark. If you choose a physical copy of KOMPLETE 12 SELECT, all of your instruments, effects, and additional content comes preloaded onto a pen drive. Its not easy to make sense of over 7,000 sounds. Thats why KOMPLETE 12 SELECT comes with KOMPLETE KONTROL a handy plug-in that makes light work of browsing through all your instruments and effects, whether using NI hardware or your mouse and keyboard. And since each instrument preset comes with an audible preview, you can audition all your sounds without waiting for extra plug-ins to load. Save over 80% of the combined cost of all included proucts. Save on a future upgrade to KOMPLETE 12 or KOMPLETE 12 Ultimate. Includes Massive - a genre-defining wavetable synth with a colossal sound. Three effects - Replika for pro-grade delay; Phasis for classic phasing sounds with a twist and Solid Bus Comp for adding power and punch to tracks, buses or a full mix. Easy Installation from one pen drive. Easy setup, activation and updating via Native Access. Optimised for use with Komplete Kontrol S-Series keyboard. Seamless integration with Maschine software and hardware. Register your product and receive a $25 e-voucher to spend at the NI Online Shop. Discover Series West Africa - Vibrant percussion and enchanting melodic instruments plus an intuitive pattern sequencer. Play djembe, dunun, bells, and more solo or as polyrhythmic ensembles. True School - New in Komplete 12 Select - Fusing the old and new school, TRUE SCHOOL shares the spirit of creative beatmakers who use their deep knowledge of hip hop production to break the rules. Forget dusty clichés and aim high with a new future aesthetic. Velvet Lounge - New in Komplete 12 Select - Tap into the sound of future soul with sultry melodies, liquid atmospheres, and forward-thinking rhythms that blend the deep musicality of classic soul with the cutting-edge production of contemporary urban styles. Deep Matter - New in Komplete 12 Select - Sparse found-sound percussion melds with polished synth grooves, sub-bass drones, and pulsing synths for an authentic homage to the atmospheric, ethereal techno of contemporary Berlin.